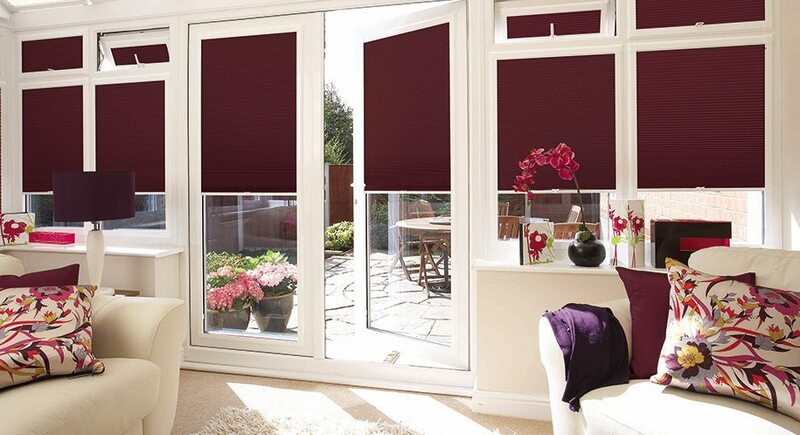 Once you have had a conservatory built, why not give it the finishing touches by adding some lovely blinds to it. These will keep the sun out and give you the right amount of privacy you need. We design two types of blinds; side window blinds and roof blinds. Both look very attractive and are very easy to clean. When choosing your conservatory roof blinds, they need to be measured and fitted by a highly trained person. We would not recommend this be taken on by the average D.I.Y. householder which is why you do not see this type of blind being sold online. These blinds need special care and attention when they are being fitted so please contact us so we can help. We are happy to say though that our conservatory side window blinds are an easy fit, D.I.Y. blind if you use the Perfect Fit blind system. These are ideal for anyone who is good at D.I.Y. and even for those who are not. We can offer you two types of blinds for the side windows of your conservatory; Pleated Blinds or Venetian Blinds. Both types are supplied as Child safe blinds which is an added bonus especially if you have children. 90% of the Perfect Fit Pleated Blinds we supply for conservatory side windows will be of a plain fabric. They will all come with a reflective coating facing the window to reduce the heat and glare. When it comes to ordering, the colour of the blind is entirely the customer’s choice but we would advise against going for white in a south facing conservatory as it produces a lot of glare. Another point to bear in mind with pleated blinds is the loss of vision when the blinds are in full use but this can be overcome with the dual operation system. The dual operation system allows you to slide the top and/or bottom rail up or down to position the blind where you want it. This is something that our clients definitely consider when ordering these blinds. The other type of blind that we can supply for the side windows in your conservatory is the Perfect Fit Venetian Blind. This blind is operated by sliding the bottom rail up or down the window. The slats are rotated by a small wand to provide the shade and privacy you require. The blind does not have to be fully closed to give you privacy and shade. It will allow you to see outside which is ideal if you have young children playing in the garden on a warm summer’s day and you need to keep an eye on them. It is a win win situation. The biggest complaint our customers have had in the past about venetian blinds is that they gather dust. Luckily our customers along with ourselves have noticed this is not the case with our Perfect Fit Venetian Blind system. We have designed these blinds to sit very close to the window. This prevents the air from circulating around the blinds, reducing any dust from getting onto the slats. We have found that our white Venetian Blinds do not present the same glare problems that we get with Pleated Blinds so we do recommend a Satin finish to any of the light colours as this tends to give a more pleasing finish to the blind than our gloss finishes. We are happy to say that both types of blinds are completely child proof. We have come up with a design so that any cord is under spring tension and sits within the Perfect Fit frame. This way there will be no loops of cord for a child to get caught up in and will prevent them from strangling themselves. Any opening window that has a Perfect Fit Blind fitted to it can still be used fully. Whether it be top, bottom, or side hung, this gives you the added bonus of ventilation whilst providing shade without the billowing and rattling you get from other types of blinds such as vertical, roller or roman blinds. Another advantage to having the Perfect Fit Conservatory Blind system is that the blinds are attached to the windows which leaves the window sill completely clutter free and open. Which is another reason why these blinds are so popular with our customers. The Perfect Fit Blind system, whether it be Pleated or Venetian is an easy, clip to fit D.I.Y. blind that anyone can measure and install. You will only need a credit card to ensure the correct spacing of the clips and simply snap the blind in position and that’s it, job done. There are no drilling holes or screwing brackets into your window frames so you can be assured that you will not be able to break or damage your sealed glass unit. The Perfect Fit blind system is easily removed from the window by simply pushing the locating knibs in and pulling the Perfect Fit frame and blind out of the window frame. We try and make it as easy for you to fit these blinds once you have received them. It will normally take 12-14 working days for you to receive your blinds from the confirmation of order. If there is any aspect of the Perfect Fit Conservatory Blind system that you would like further clarification on, please send us an email using the CONTACT US page and we will try to answer your questions. To obtain a quotation please click on your blind preference at the top left hand column and input your sizes.